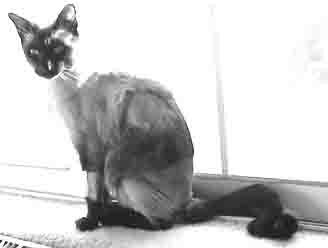 This is what our backup cat looked like a week or so after his June 2002 surgery for somehow breaking 100% of his two hips. Both front legs were shaved for IVs, the hindquarters was shaved for the surgery, and the left upper back was shaved for the fentanyl patch (which, in case you're wondering, tastes terrible). The baleful look in his eyes, directed at me because I'm taking his photograph, belies the dignity and equanimity with which he has endured the pain, the fear, and the humiliation of looking like a raggedy poodle. For reasons that should be obvious, his name is Bentley. Actually, even though it's hard to tell from this photo, his tail is bent twice, so that it always makes a Z. On what might seem like a different subject, here is the scan of a photo I took at a doctor's office. This is an eye chart for use by patients that can't read the usual letters of English -- E FP TOZ, and so on. The testee's answers will be whole words for common shapes such as square, circle and heart. Based on my understanding of natural selection, I declare that we humans will, over many centuries, become progressively more blind. Now that we've invented methods of vision correction such as eyeglasses and laser surgery, there is no longer any evolutionary pressure to kill off those of us born with poor vision because we couldn't see that saber-tooth tiger crouching over there in the bushes. The chart at left is designed -- and designated as such -- for illiterates. And at this particular medical facility, as it turns out, there's no doubt evey patient is illiterate. Because the eye chart above is tacked to the wall of an exam room, just as a joke that few people get, at the veterinarian's office, Mission Medvet, where Bentley was treated.